A lonely princess named Eliza uses her engineering talents to help Santa’s overwhelmed elves get ready for Christmas toy deliveries. This substantial, rhyming story introduces Eliza and her protective parents, who live in a huge castle in a remote, snowy kingdom. Eliza, who appears to be 6 or 7, is “brainy and bright,” but she has no friends or social life. She spends her days creating unusual machines, such as an odd-sock sorter and a sock-folding machine. Escaping the castle, Eliza ends up at Santa’s workshop, where the elves are seriously behind in their work. Eliza invents a letter-reading machine, a “robotic gift-picking contraption,” and a present-wrapping machine and makes modifications to Santa’s sleigh. 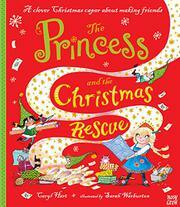 A grateful Santa invites her along on his Christmas Eve flight along with her new posse of elf friends, and Eliza’s parents accept her special talent and build the princess her own workshop. The bouncy text written in rhyming couplets is well-matched by large-format, mixed-media illustrations filled with humorous details and intriguing, complex contraptions of Eliza’s design. The royal family and Santa are white; the charming elves include both males and females as well as elves of color.